"Bird people" redirects here. For other uses, see Bird People and Birdman. 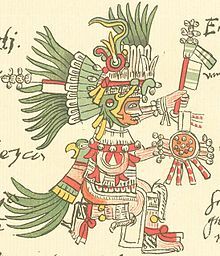 Huitzilopochtli, national god of the Aztecs. 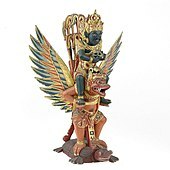 The Garuda, eagle-man mount of Vishnu in Hindu mythology, was pluralized into a class of bird-like beings in Buddhist mythology. 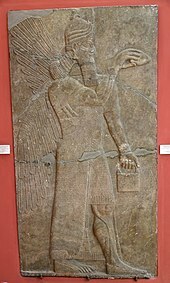 The gods Horus and Thoth from ancient Egyptian mythology were often depicted as humans with the heads of a falcon and an ibis, respectively. The Tengu of Japanese folklore, monstrous forest and mountain dwelling humanoids often possessing the wings, claws, and sometimes the beak of a bird. The winged people of Normnbdsgrsutt in Robert Paltock's utopian fantasy Peter Wilkins (1750), including Youwarkee, whom Peter marries. The Flock from James Patterson's Maximum Ride novel series. The bird people of Brontitall, led by The Wise Old Bird, in The Hitchhiker's Guide to the Galaxy are depicted by Douglas Adams as evolving from humans who are so sick of buying shoes that they become bird-like creatures and never set foot on the ground again (see Shoe Event Horizon). The race of garuda in fantasy author China Miéville's world Bas-Lag as featured in Perdido Street Station. In J.K. Rowling's Harry Potter series, a race of magical creatures called Veela appear as extraordinarily beautiful women, but turn into frightening bird-like creatures when angered. The Rito in The Legend of Zelda game series. ^ Allen, James W. (2000). Middle Egyptian: An Introduction to the Language and Culture of Hieroglyphs. Cambridge, UK: Cambridge University Press. ISBN 978-0-521-77483-3. ^ Robert E. Buswell Jr.; Donald S. Lopez Jr. (2013). The Princeton Dictionary of Buddhism. Princeton University Press. pp. 314–315. ISBN 978-1-4008-4805-8. ^ Roshen Dalal (2010). Hinduism: An Alphabetical Guide. Penguin Books. p. 145. ISBN 978-0-14-341421-6. ^ Helmuth von Glasenapp (1999). Jainism: An Indian Religion of Salvation. Motilal Banarsidass. p. 532. ISBN 978-81-208-1376-2. ^ Wilkinson, Richard H. (2003). The Complete Gods and Goddesses of Ancient Egypt. Thames & Hudson. ISBN 978-0-500-05120-7. ^ Griffiths, J. Gwyn (1980). The Origins of Osiris and His Cult. Brill. ISBN 978-90-04-06096-8. ^ "China: 'Master Thunder (Lei Gong)', a Ming Dynasty hanging silk scroll from 1542, Metropolitan Museum of Art, New York". AKG Images. Retrieved 5 October 2018. ^ S. A. Barrett (1919-03-27). "Myths of the Southern Sierra Miwok". University of California Publications in American Archeology and Ethnology. 16 (1): 1–28. ^ Bailey, James; Ivanova, Tatyana (1998). An Anthology of Russian Folk Epics. M.E. Sharpe. p. 27. ISBN 978-0873326414. ^ Hart, George (1986). A Dictionary of Egyptian Gods and Goddesses. London, England: Routledge & Kegan Paul Inc. pp. 179–182. ISBN 978-0-415-05909-1. ^ Routledge, Scoresby, Mrs; Routledge, Katherine (1917). "The Bird Cult of Easter Island". Folklore. 28 (4): 337–355. JSTOR 1255484. An "iviatua," a divinely-gifted individual, dreamed that a certain man was favoured by the gods, so that if he entered for the race he would be a winner, or, in technical parlance, become a bird-man or " tangata manu"; it was also ordained that he should then take a new name, which formed part of the revelation, and this bird-name was given to the year in which victory was achieved, thus forming an easily remembered system of chronology. ^ de Visser, M. W. (1908). "The Tengu". Transactions of the Asiatic Society of Japan. 36 (2): 25–99. ^ Paltock, R.; Bullen, A.H. (1884). The Life and Adventures of Peter Wilkins. The Life and Adventures of Peter Wilkins. Reeves & Turner. p. xvi and passim. Retrieved 5 October 2018. ^ "Perdido Street Station By China Miéville". Penguin Random House. Retrieved 5 October 2018. Cathy S. Mosley. ""The Princess of the Bird People" a retelling of "Manora, the Bird Woman," from Thailand". H-NILAS: Stories for the Seasons. Retrieved October 31, 2005. — This cites Toth, Marian Davis (1971). Tales From Thailand. Tokyo: Charles E. Tuttle. .